Vegetable Mina – Matzah "Lasagna"
We have been craving lasagna but it’s been difficult to find a vegan lasagna noodle so we have gone without. I have considered making my own, though pasta is a little on the labor intensive side especially for someone as unskilled as myself and just haven’t made the time. Recently I stumbled across a dish called a Mina, which was referred to a Matzah lasagna and is traditionally made much like lasagna with cheese or meat. Being as Passover is just around the corner, Matzah crackers are readily available in grocery stores this time of year. You need to read the label though because from what I understand some are made with eggs though I haven’t see them. The Matzah crackers I bought came in 6″ X 6″ which were perfect for a casserole dish. Felipe, my hubby is Italian and one dish I mastered early on was Vegetable Lasagna, back in the day when our diets allowed cheese and eggs. For this recipe I revisited my old recipe and modified it to be vegan. Hubby said that if I didn’t tell it would be hard for people to guess that it wasn’t noodles. There are a few different steps so I have broken it down. If for some reason it is hard to follow please let me know. 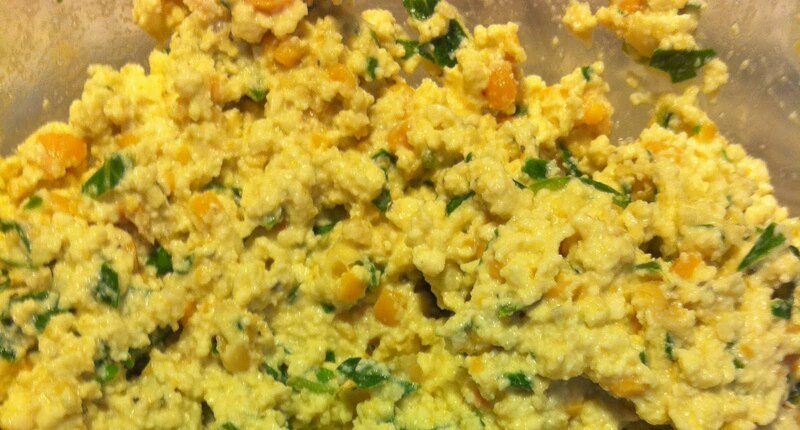 Place tofu and garbanzo beans in a bowl and mash with a fork until the consistency of ricotta. Stir in remaining ingredients. Let while preparing the rest of the ingredients. Ricotta before spinach was added. In a large frying pan add 1 tsp olive oil, 1 tsp water and a few shakes of garlic powder. Saute portabella over medium heat for three minutes on each side. I had to do it in three batches so I added more olive oil, water and garlic powder for each batch. Cook the same as portabella’s except you are using oregano instead of garlic powder and cook for 5 minutes on each side. Figure out how many Matzah you need to cover your casserole dish and triple the number. I needed two Matzah’s to cover the bottom of my dish so I used 6 for the recipe. Fill your casserole dish half full of water and but the Matzah’s in the water to soak for 3 minutes. Remove from water and let drain on a paper towel. 2 jars of your favorite tomato sauce (depending on size of casserole dish you may need less. Preheat oven to 375. Dry casserole dish completely. Grease bottom of dish with butter. Pour olive oil over and moved dish around until bottom is completely covered. 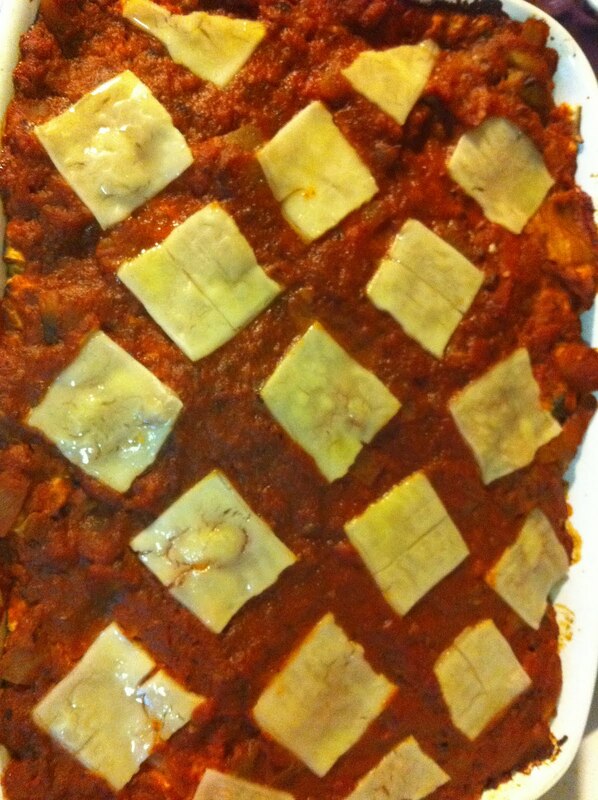 Cover casserole with a single layer of Matzah. 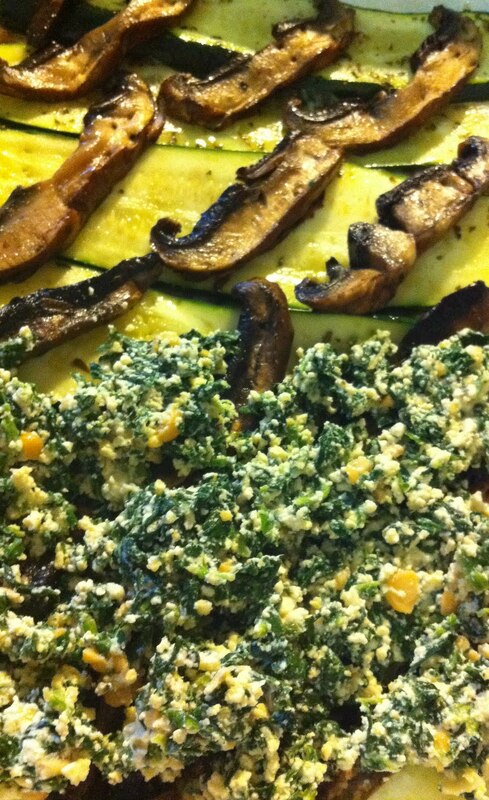 Top with 1/2 of zucchini, 1/2 of portabella, 1/2 of ricotta and 1/2 sauce. Start over with Matzah and start over but before putting on other 1/2 of sauce cover ricotta with remaining Matzah. Cover with the other 1/2 of the sauce. Top with cheese if you like. Bake for 45 minutes. Cool for a few minutes and enjoy. A view of the layers. 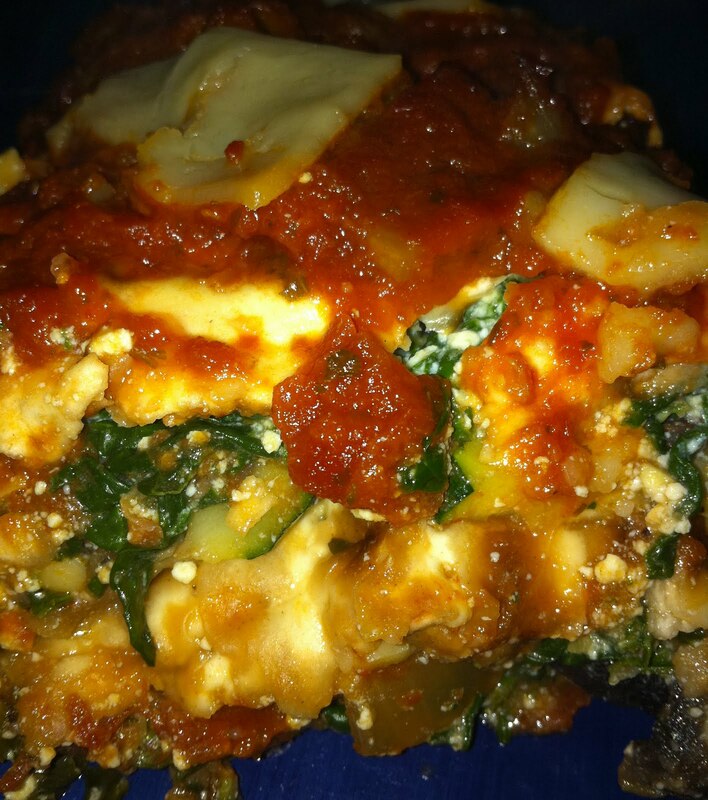 1 Response to Vegetable Mina – Matzah "Lasagna"